The search for a long-lost Nazi train, carrying what is believed to be billions of dollars in gold, may be over before Christmas, as Polish mining experts are in the final stages of analyzing data from the site where two men allege to have located the wagons. According to Krakow University of Science and Technology spokesman, Bartosz Dembinski, the group of experts from the institution are close to conclude whether there is a train at the spot identified by two amateur treasure hunters in August. The scientists used magnetic, gravitation and earth-penetrating equipment to check the railway bank in Walbrzych, southwestern Poland, and should be ready to release their findings in mid-December, said earlier this week. 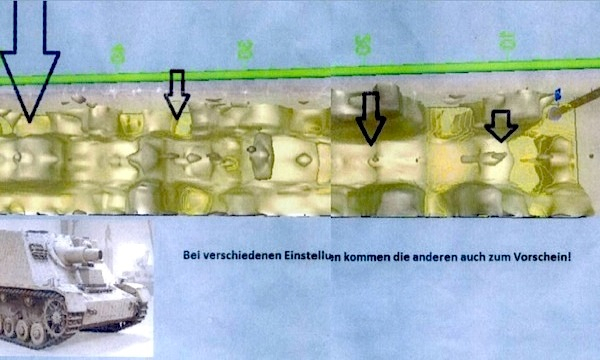 German Andreas Richter and Polish Piotr Koper have already produced a rudimentary image of the train using ground-penetrating radar. Local officials have suggested that because of the annual winter snowfall in Poland, digging may not start until the spring. 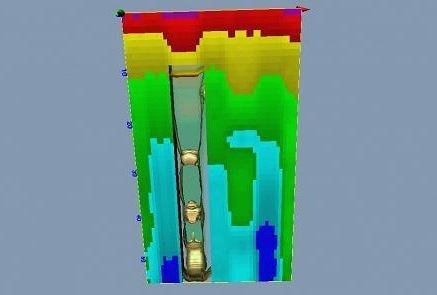 Radar image posted on Ritcher and Koper’s website that allegedly shows the train. © 2015 XYZ Spółka Cywilna Piotr Koper & Andreas Richter | Logowanie. According to tales that have circulated since WWII, the Nazis hid a train containing up to 300 tons of gold, as well as diamonds and firearms. The Polish government has done little to dampen speculation, as authorities said in September they were “99% certain” the train actually exists. A number of trains are believed to have been used by the Nazis in the 1940s to transport goods stolen from people in Eastern Europe back to Berlin. While some might have made it to the German capital, others are said to have been left behind by Soviet troops, as they advanced in 1945. Police officers continue to patrol the wooded, shrub-covered site to keep swarms of treasure hunters from digging.